A certain long-running musical had lots of singable names for the animals that purr and meow: practical cats, dramatical cats, pragmatical cats, fanatical cats. Oratorical cats, Delphic oracle cats, skeptical cats, dyspeptical cats. Political cats, hypocritical cats, clerical cats, hysterical cats. Cynical cats, rabbinical cats. There were no cloned cats in "Cats." But yesterday, two of them landed in New York in preparation for what the people traveling with them said would be the first display of cloned kittens at the annual cat show at Madison Square Garden, which begins tomorrow. Actually, the two kittens and the donor cat landed in Teterboro, N.J., in a chartered jet. Then, like celebrities, they were driven to Midtown Manhattan in a limousine. Of course they had an entourage. It included executives of the California company that brought them into being, a company whose name is likely to prompt pun haters to caterwaul: Genetic Savings & Clone. The two cloned cats are named Tabouli and Baba Ganoush. They are 4 months old. 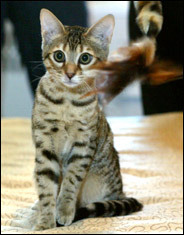 They are genetic duplicates of Tahini, a female Bengal cat who made the trip with them, but in a separate carrier. The two clones were carried by different mothers - one a tortoiseshell, the other a Lynx Point (a breed many cat lovers call a color point Siamese). Lou Hawthorne, the chief executive of Genetic Savings, said Tabouli had "this health issue" - conjunctivitis, a malady also known as pinkeye, which is being treated with antibiotics. He did not want Tabouli's face photographed, even though, from across a crowded hotel room, Tabouli's eye did not look as bad as if, say, Baba Ganoush had taken a hard swipe at her. They appeared as playful as any two kittens who had just endured a long airplane flight and were now exploring a strange place. Tabouli sniffed the bed and seemed fascinated by a photographer's camera. Baba Ganoush chased a toy that looked like a tiger's tail when Pam DelaBar, the president of the Cat Fanciers' Association, dangled it in front of her. Mr. Hawthorne sprawled on the bed with the two cats. He said the company had several "pregnancies in progress" and talked about Peaches, the 8-week-old clone of Mango, an orange cat that belongs to Leslie Ungerer, the animal handler who was keeping watch on Tabouli and Baba Ganoush. Mr. Hawthorne said the company would deliver five cloned cats in the next few months. It turned out that cloning a dog is harder than cloning a cat, and after being deluged with cat owners wanting exact copies of Tigger or Muffie, the company financed a grant to Texas A&M University. 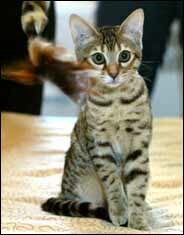 A cloned cat called Cc - the abbreviation for carbon copy, pronounced "see-see" - was born there in December 2001. Everything has a price. Genetic Savings & Clone charges $50,000 for a cloned cat and $295 to $1,395 to store a cat's genetic material. And the Missy clone? Missy - three-quarters border collie and one-quarter Siberian husky - died in 2002. But the company has her genetic material in storage. The Cat Fanciers' Association, which produces the annual cat show and maintains the world's largest registry of pedigreed cats, is setting up a gene bank with Genetic Savings. Allen Scruggs, the show chairman, described the cat fanciers' group as "a very old and very conservative organization." He said its interest in cat cloning reflected its interest "in showing the world that we were not so stuffy and fuddy-duddy - that we were aware of what technology has presented the animal world." "We had heard this discussed on and on and on," he said, "and it finally happened. There is huge interest in the cloning of cats." Mr. Hawthorne said the bank would "rigorize the registration" of cats. "Right now, when C.F.A. establishes a pedigree, that pedigree is based to some extent on honor and reputation, signatures on documents and so on," he said. "There's really no scientific backup that the claimed pedigree is the pedigree." The bank could provide that, he said, and could store cells for cloning as well. So what about Tabouli and Baba Ganoush? He said he had intended to adopt Tabouli, but his sister pre-empted him and adopted both cloned cats. "It's really fun to see how much personality they have," he said. "I like seeing the personality similarities as well as the differences. We've been hearing critics say for years, 'There won't be any personality similarities, and they won't even look that much alike.' We've seen how much they look alike, and we've seen dramatic personality similarities. We've seen some differences as well. It's something to reflect on. If you have it right in front of you, it's like having a nature-nurture experiment right in your living room."